Previously, we have reviewed many apps for kids to learn about shapes. Yet, there hasn't been one as fun as Doodle Critter Math: Shapes. It offers six mini games that focus on six basic shapes: triangle, rectangle, square, pentagon, hexagon, and circle. Doodle Critter Math: Shapes lets juniors build animals and other objects using six basic shapes. The first game lets you learn about shapes by watching how they are drawn. You start by tapping a doodle critter to make it jump around the screen, leaving behind a trail of dots. When all the dots have been laid out, the doodle critter will connect these dots to create the shape. 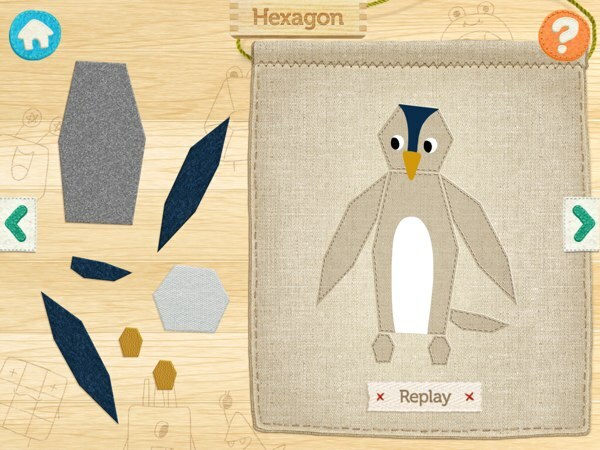 You can then play a jigsaw puzzle where you create a bird from triangles or a giraffe from rectangles. In the following two games, you are asked to identify objects that match a shape. In the Sort Out Shapes game, you are asked to feed the doodle critters with cookies that match the shape of the critters. Then, you get to identify the shapes of real world objects like sandwiches, buttons, and globe in the Match the Pairs game. The fourth game is called Remember Shapes. In this game, you need to quickly identify shapes before they hide inside boxes and find where a shape may be hiding. As you progress through the game, the app will swap the boxes to force you to focus even more. The final two games are based on jigsaw puzzles that consist of the basic six shapes. In the Make Different Shapes game, you can put all the pieces together to make different animals, such as elephant and alligator. In the final game, you get to find all the hidden shapes in an illustrated story. This app is developed by NCSOFT, the same development team behind Meet the Insects series. Meet the Insects is a series of encyclopedic apps that explore the world of insects, designed for kids ages 8+. Doodle Critter Math is for younger kids, ages 3+. Every mini game in Doodle Critter Math: Shapes has 10 stages, which gradually grows more difficult. All these games are designed to reinforce the concept of shapes. If you like this app, you can also check out the first app in the Doodle Critter series, Doodle Critter Math: Numbers, which helps juniors learn the basic concepts of numbers from 1 to 10. Doodle Critter Math: Shapes uses several games to help kids remember the six basic shapes. Doodle Critter Math: Shapes teaches kids many things. Obviously basic shapes is one of them, but there's also counting from 1 to 6 and the concept of corners and sides. I like how in the first game, the narrator will count each side formed as the doodle critter draws the shape. When the shape has been completely drawn, the narrator will also announce the shape's name, along with the number of corners and sides it has. Another thing that I like is the app's fun background music, especially the one in the Sort Out Shapes game. The beat really help build the mood for playing. Doodle Critter Math: Shapes lets juniors identify basic shapes in real world objects too. Doodle Critter Math: Shapes is a fun app for learning shapes, that best fits juniors ages 3+. It has six games, in which juniors can learn about six basic shapes as well as the concept of corners and sides. Kids can also learn to identify these shapes in real world objects.